Product FeedsVM Products CSV !ULTIMATE! Finaly a Joomla migrator especially designed for VirtueMart. If you are still running Joomla 1.5 or 2.5 and VirtueMart 1.1.9 or 2.x your website is getting quite old. Old enough that neither Joomla not VirtueMart development teams are supporting this versions anymore. This migrator, is a giant leap towards Joomla 3 and VirtueMart 3 ! Every VirtueMart content from your shop will be copied over. Here is how it works. There is more! All the data will be transfered using the same ids. What does that mean? Well that means data integrity is preserved during migration. 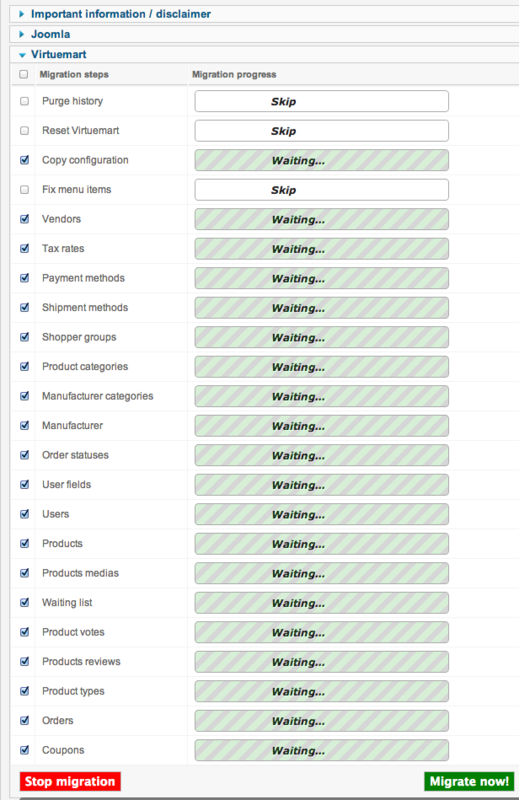 VM Migrator does not only migrates Virtuemart content, your whole Joomla! website content will be migrated too, categories, articles, users, modules... everything! Our system was run successfully on several shops with up to 20.000 products, 30.000 users and 15.000 orders. No rush, no downtime and orders still come in. No problem, hit the migrate button again and all new data will be imported so your data keep up to date. Once you are ready to go live, temporarily turn of the the orther website, import the latest items and put your new website live. Yes! The VirtueMart 2/3 Migrator is extensible and additional plugins are available to migrate data from other components such as AWO Coupon, iStraxx Shipment for Virtual Products Download, Alpha User Points and more to come. For more languages visit transifex.com.